Stimulite Contoured Cushion Sling, constructed by Supracor, supports higher levels of pressure management. More particularly, the Stimulite Contoured Cushion Sling emphasizes a 3.5-inch deep cushion that consists of various layers of pliable, Stimulite honeycomb to offer relief from pressure sores. In addition to the cushion adapting to each user's anatomy, this Supracor seat cushion is pointedly engineered with soft and firm sections. 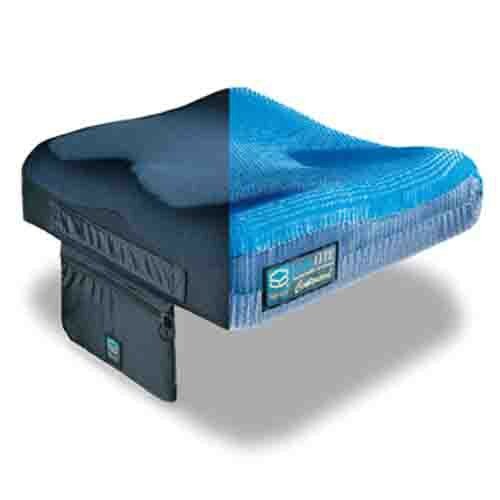 In fact, this seat cushion marks what Supracor titles a "sweet spot," a gentle, yet malleable area that gently cradles and supports the ischial bones and coccyx, arranging exceptional pelvic positioning for reinforced posture and balance. To establish greater support and stability, the base of the cushion features a convex shape to securely clinch its place on a seat. To further develop user comfort, the Stimulite Contoured Cushion Sling introduces adductors and an abductor to easily and comfortably enclose the lower appendages, without impeding patient transfers. Comfort and positioning, though, is only one facet of this Supracor cushion. Supracor devises the Stimulite Contoured Cushion Sling to be machine washable, too. This Stimulite seat cushion is readily available in various dimensions to serve unique and specific needs. To efficiently and effectively mitigate discomfort and prevent pressure sores, order this long-lasting, yet comfortable and supportive cushion today! Cradles ischial bones and coccyx. Great for higher level of pressure management. Uniquely contours to each body. Product Numbers: CD1416S, CD1616S, CD1618S, CD1816S, CD1818S, CD1820S, CD2016S, CD2018S, CD2020S. Application: To mitigate pain from pressure sores. Can the item be returned if it does not fit or is not what you were looking for?